Glaze:1/4 lb. butter1/4 c. water1 c. granulated sugar1/2 c. rum Preheat oven to 350°. Grease and flour 10-inch tube or 12-cup Bundt pan. Sprinkle nuts over bottom of pan. 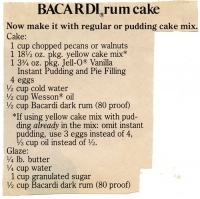 Mix all cake ingredients together; pour batter over the nuts. Bake 1 hour; cool. Invert cake on serving plate and prick top. Drizzle and smooth glaze evenly over top and sides of cake. 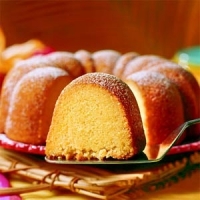 Allow cake to absorb glaze and repeat until glaze is used up. Glaze: Melt butter; stir in water and sugar. Boil 5 minutes, stirring constantly. Remove from heat. Stir in rum.